Join Authors Marci Vogel and Janet Fitch for a reading of their latest works: Vogel's Death and Other Holidays and Wallace's House of McQueen. 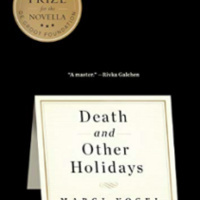 Marci Vogel is the author of Death and Other Holidays, winner of the inaugural Miami Book Fair/de Groot Prize, and At the Border of Wilshire & Nobody, winner of the inaugural Howling Bird Press Poetry Prize. Her poetry, prose, translations, and cross-genre inventions appear in Jacket2, FIELD, VIDA, Plume, Quarter After Eight, Poet Lore, Colorado Review, and Seneca Review, among numerous other publications. She is the recipient of a Willis Barnstone Translation Prize, a Hillary Gravendyk Memorial Scholarship from the Squaw Valley Community of Writers and residencies at North Street Collective in Mendocino County and CAMAC Art Center in Marnay, France. A first-generation college student, Vogel earned her PhD in Creative Writing and Literature from the University of Southern California, where she currently serves as a Postdoctoral Scholar Teaching Fellow in the Dana and David Dornsife College of Letters, Arts and Sciences. She has been invited for readings and talks at the San Francisco Conservatory of Flowers, the University of Strasbourg, Kelly Writers House, the University of Pennsylvania, the School of Beaux-Arts in Tours, France, and the University of Louvain-la-Neuve, Belgium. She is currently working on a new book-length manuscript engaged with questions of language, displacement, ecosystems, and redwoods of California. Janet Fitch is an American author and teacher of fiction writing. She is the author of the #1 national bestseller White Oleander, a novel translated into 24 languages, an Oprah Book Club book and the basis of a feature film, Paint It Black, also widely translated and made into a 2017 film, and an epic novel of the Russian Revolution, The Revolution of Marina M.
Additionally, she has written a young adult novel, Kicks, short stories, essays, articles, and reviews, contributed to anthologies and regularly teaches at the Squaw Valley Community of Writers. She taught creative writing for 14 years in the USC Master of Professional Writing program, as well as VCFA’s Writing and Publishing program, A Room of Her Own (AROHO), the UCLA Writer’s Program, and Pomona College. She lectures frequently on fiction writing. Fitch was a 2009 Likhachev Cultural Fellow to St. Petersburg, Russia, a Helen R. Whiteley Fellow, a Research Fellow at the Huntington Library and a Moseley Fellow at Pomona College. Fitch graduated from Reed College in Portland, Oregon in 1978 with a BA in History. She lives in Los Angeles and travels whenever she gets the chance.